Thanksgiving November 26, 2008. Mayor Bloomberg Collection, NYC Municipal Archives. Mayor Michael Bloomberg with Kermit the Frog and security staff, Thanksgiving, November 26, 2009. Mayor Bloomberg Collection, NYC Municipal Archives. Hello Kitty, Thanksgiving November 28, 2013. Mayor Bloomberg Collection, NYC Municipal Archives. Paul Frank’s Julius The Monkey, Thanksgiving November 28, 2013. Mayor Bloomberg Collection, NYC Municipal Archives. SpongeBob SquarePants, Thanksgiving November 28, 2013. Mayor Bloomberg Collection, NYC Municipal Archives. 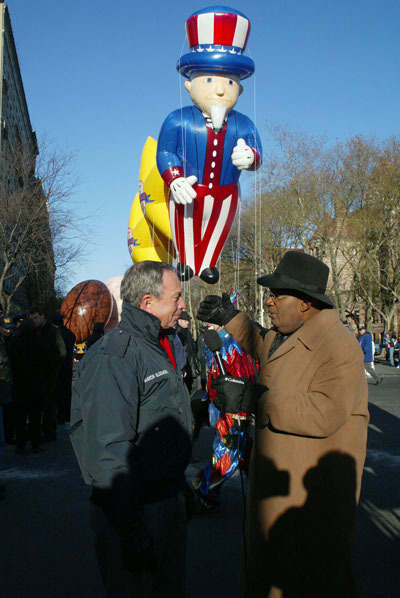 Mayor Michael Bloomberg with Al Roker and Uncle Sam, Thanksgiving November 29, 2002. Mayor Bloomberg Collection, NYC Municipal Archives.